Product #45588 | SKU LKBU-PT-AMBH-US | 0.0 (no ratings yet) Thanks for your rating! The Avid Pro Tools Apple Backlit Astra American English Keyboard from LogicKeyboard is a dedicated USB keyboard for controlling Avid Pro Tools. Five levels of user-selectable illumination can be set based on the current ambient lighting, making work in a darkened environment a breeze. 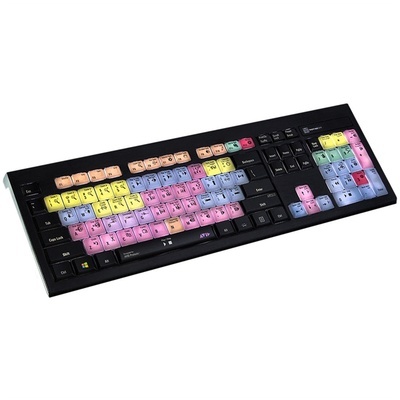 The keyboard is ideal for post-production facilities, professional video editing houses, and anyone else who requires all the custom key commands to be readily accessible from a clearly labelled, colour-coded keyboard. With one wire for the USB hub and a separate one for the keyboard, the Astra series is ideal for editing systems that use USB KVM extenders, and installations that require data security. The keyboard also features all the regular letter, number, and symbol labelling found on a conventional Apple keyboard, allowing it to be used for any typing duties. It is easy to set up and use, with no additional software required.